The Death of Model Making? | Sydney House. The Death of Model Making? Is it real? Or imagined? Since our journey through the design process began for our own home, one thing has struck me. Computers, indispensible as they are, seem to have removed the one thing I loved about the idea of designing or building (or extending) a house: the beautiful hand-built architectural model. We got to see a pretty wowsa 3D rendered video of our plans. There’s something about seeing ideas transformed into shape, light and movement that is quite mind-blowing… even for my husband and I, both of whom have been experienced in the creative technical field for many decades. But then I got to thinking. I felt like an old biddy reminiscing. Back in the 1990s (sigh), when we shared our building with the wonderful architects Sam Marshall and Stephen Varady in the old Kings Disposal Building at Railway Square, George Street…model making was at fever pitch. (Incidentally, we were the original hipsters. We lived in the city when no one did. We had our own little 4 floors of creative community). We used to bounce down the stairs from our converted 4th floor (which we renovated), for a morning coffee or wave. Into the first floor, there was Stephen and Sam and their staff of students and employees beavering away at big drawing desks. Table spaces were sometimes filled with concentrated model-making for their clients. I wish I had pictures, I am sure I do somewhere. Alas, the sheer joy of seeing, touching and moving a model around – now that’s something else. I am still secretly yearning for such a thing. A real life house. In miniature. Smaller than doll sized. Sigh. I have had some fun seeing models since the 1990s…albeit brief. In 2003, Sam Marshall put on an exhibition called Supermodels which showed off rooms of amazing architecture models. And its true to say that many of the “celebrity” architects around the world (big names Norman Foster and the like) still engage staff in model making as part of the creative process for all their projects, not just the complex often large scale urban and commercial projects. And Rightly. But it seems like economics prevents this from being part of the norm for most architects these days. In Paris in 2008, we stumbled across Renzo Piano’s model making HQ. (See photo). Joy! 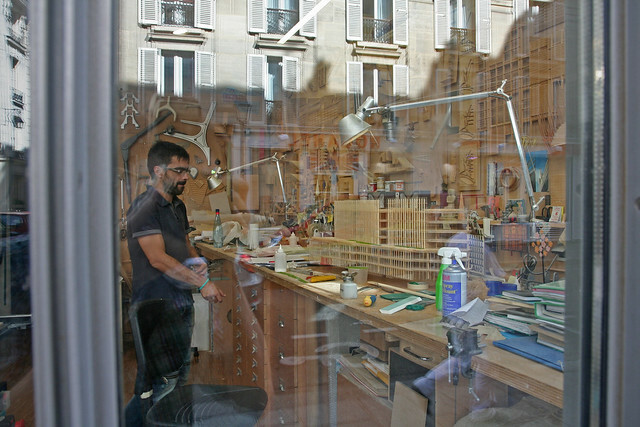 Renzo Piano’s Building Workshop, Paris – right in the shopfront for all to see.